Dedicated to Anibal Barrow - Posada y Permiso (translated in English as shelter and permission) is a response to the migration of Central American women and children (primarily from Honduras, Guatemala, and El Salvador) to the United States and the ensuing humanitarian crisis currently unfolding in detention centers located on the border with Mexico. It is a meditation and an investigation into the social, historical, and emotional turmoil faced by trans-national migrant families in their dangerous and urgent quest to take part in the American Dream. Much of this work is in conversation with my previous projects, which delve into my own personal reflections of growing up as a first-generation Honduran-American whose ancestry and identity is punctuated by migration, assimilation, violence, and resettlement. 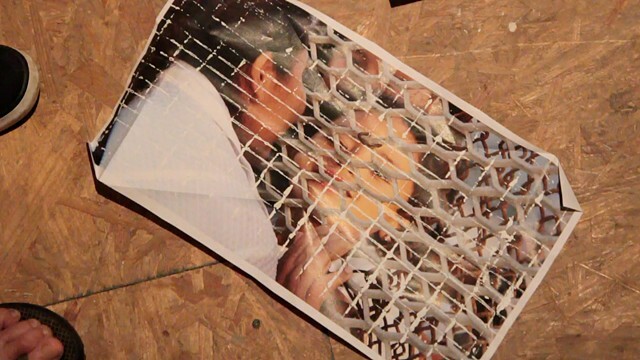 For this performance, I morphed into different personas (Obama, a smuggler, a US Border agent, a child, a street thug) while tearing open small mailing packages containing plastic toys and color photos of women and children held in present-day detention centers. During the performance I sang 80's pop tunes, recited poetry in Spanish, and made viewers complicit in the process by making them describe the geography and features of popular U.S. tourist destinations.